It’s officially autumn now, and it’s obvious here in northern Nevada. The days are shorter, the nights are getting cooler, the leaves are turning, and there are apples galore all over town. We’re easily reminded of the flow of constant change. I’m not feeling inspired to write this week (too many ideas to settle on one! 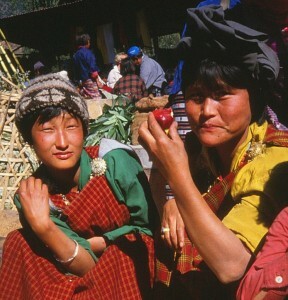 ), so I thought I’d share this photo of two Bhutanese women enjoying their apples at the market in Thimpu in the fall of 1986. May you too enjoy the autumn fruits! This entry was posted in Asia and tagged Impermanence. Bookmark the permalink. yes, and I remembered the blog is as much about the photos as the words…nice when I don’t have much to say!